Is the Marketplace killing the Mall? In the real world, the concern tends to be the other way – at least in the UK, as worried campaigners declare that the out-of-town malls are throttling the life out of High Street stores in market and county towns the length and breadth of the country. But in Second Life, things are different. Here the owners of malls are concerned that the online Marketplace is offering unfair competition and ripping out the heart of their trade. Is this, in fact, the case? When merchants began realizing that the majority of their sales were coming from SLM and that their in-world shops were severely decreasing in visitors, they recognized those shops were a bad investment. As a result untold numbers of merchants shut down their satellite stores in favor of one main store– if even that (some merchants have no in-world stores at all and instead switched completely to SLM). Their sales remained basically the same, while their rental investments dropped to nothing. The management of their stock suddenly became much easier as well, as they no longer had to support multiple venues. Can’t blame the merchants or the customers for that. That’s just sensible business. But stores across Second Life started shutting down. When merchants stopped renting market space, sim owners could no longer keep markets open. Since those markets often paid for a large chunk of sim fees… sim owners could no longer afford to keep their sims open. Entire sims shut down because their primary financing system– their in-world markets– emptied out. I can’t count the number of sim-owner friends who contacted me and said they were shutting down their sims because their markets were dying. Although some may be tempted to suggest that this last point from Wayfinder Wishbringer is a case of “Well, he would say that, wouldn’t he?” I have to point out that my researches bear him out. I’ve visited several sims where I expected to find themed markets or malls – and many of those have gone. It may be churn … but I think he may have a point about a shift in business patterns. 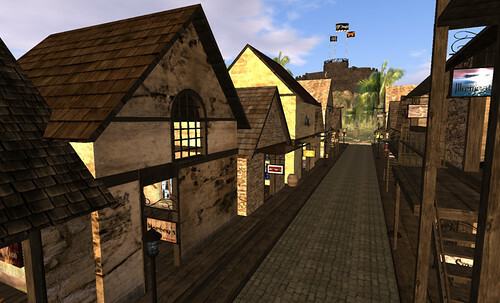 There are, generally speaking, three kinds of places where you will shop in Second Life. The first is the online Marketplace, developed from a number of independent initiatives by residents (such as OnRez and Second Life Exchange). These were eventually bought out by Linden Lab and amalgamated into one united Marketplace. Creators selling in the Marketplace pay fees (unless their goods are themselves free), and can pay additional fees for preferential listings. Creators are not allowed to vary prices they charge inworld and in the marketplace – they can’t charge more to compensate for the fees but, on the other hand, they will not be paying rent for the land their store is on. 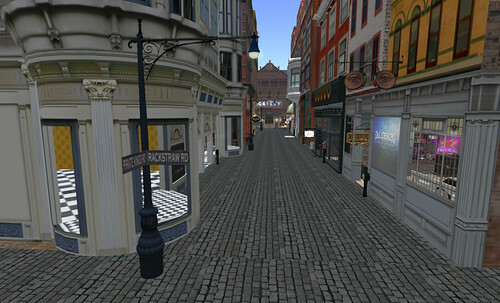 Many successful or well-established designers will also have a mainstore inworld. This may occupy an entire sim (if their income justifies it) or may consist of a group of stores renting together – possibly with a main store renting places to people with whom s/he feels compatible. Rayvn Hynes of MudHoney does this and says that for her it makes more sense to create a commercial area to support her store, rather than rent out homes. Some stores (such as Truth, the hair store, which has the Truth District) are so successful that they can attach a second commercial sim. Where this happens, the store owners will tend to be friends of the original store owner, or perhaps creators in the same area. We can divide malls into three types. First there are the general malls. These evolved on the mainland – and were generally created by landowners deciding to make money through commercial rentals rather than through home rentals. Sometimes these are themed – I remember a set of Tudor gabled stores that several landowners used to create small historically-themed towns back in 2007 – sometimes these are just rather basic concrete blocks. Some follow a city theme – there are several European cities such as Paris, Venice and Milan. There are some lovely ones around – such as the seaside cove that houses Icing and a number of other stores. The second type is those created deliberately to be showcases for stores that have their main locations elsewhere. Two examples of this type of mall are The Nest and the Home and Garden Market. Often these sort of malls are stunningly designed – The Nest re-creates a Mid-Western town circa 1950, complete with the wrong side of the tracks, for example. The aim of these malls is not to sell goods – although goods will be placed for sale – but to inform people about the different brands, and to sell those. In truth, Elf Clan invented one of the basic business models that helped put Second Life on the map (no brag, just fact). Our business model was to retain half the sim for group use (our castle, sporting lands, gardens, etc) and rent out the other half of the sim to pay sim fees. 8 plots x $24 a month pretty much paid for everything. By taking one of those plots and turning it into market space and renting out market booths for 4 times normal residential fees, we even pulled a small “profit”– which we sunk into paying setup fees and purchasing further sims. That model proved to work so well that before long hundreds of groups were following that concept, and Second Life boomed. This doesn’t necessarily affect creators’ sales, of course, even inworld. All evidence is anecdotal, but the overwhelming impression that I get is that people divide their purchases largely between Marketplace and mainstores – and many use the Marketplace to search for products that they then buy inworld. “I’m with many people, casting a wide search over Marketplace and then visiting the store in world,” says Qwis Greenwood. “Some things must be examined in-world (furniture, for one), and maybe I’ll go Marketplace later, but I have to see it in person first,” says Jedburgh30 Dagger. “When I go buying for me, I use Marketplace, but usually go to the in-world store to check out the quality,” says Lizzie SaintLouis. “I look through Marketplace but prefer for the vendor to have a place in-world so I can see a demo & either buy it there or via Marketplace,” says DMom2K Darwin. This point about seeing things in person is an interesting one. 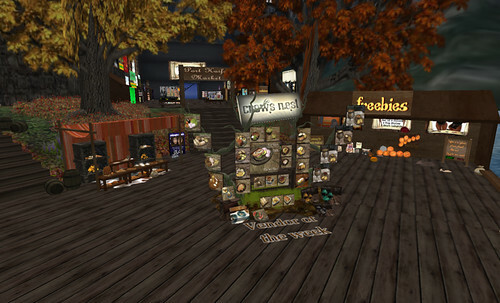 Many stores will, of course, be displaying the same vendor pictures that are to be seen on the Marketplace, so it is clear that the inworld shopping experience adds more – the ambiance of the store, possibly useful store assistants who can display objects. Even other shoppers can add to the experience – although there can be too many, creating problems with lag. Jedburgh30 Dagger agrees: “As a consumer in Second Life, I have had nothing but trouble in finding things in search in-world. So I end up relying on blogs or Marketplace. …and yes, some stores are so brutally lagwracked I won’t go there on a dare. I found that one store I really really liked went to a very Marketplace based selling strategy, because of tier. 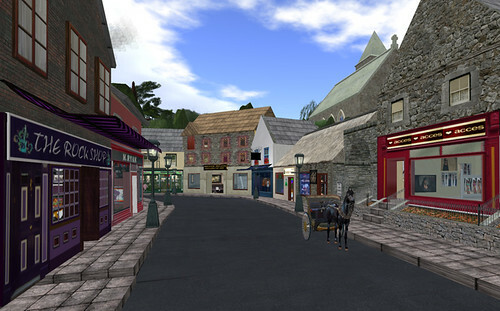 Nevertheless, despite the lag problems, again and again people returned to the inworld shopping experience. One issue that was raised was problems of search. Overall, it does seem that people value the inworld shopping experience. Even when they can buy on Marketplace, most people seem to prefer – unless time constraints or problems with lag get in the way – to make the trip to a virtual store, sometimes so that they can gain a sense of the product (with furniture and houses, for example), but sometimes because they can gain a sense of the product by seeing the store in situ. Which is a rather interesting psychological point – after all, these are all images on a computer screen. But people clearly value the shopping experience, and the exploration – it may be one reason for the popularity of Hunts (the first taping of Happy Hunting! saw a packed studio, by the way). But the Marketplace, of course, links to the mainstore. People who browse the Marketplace and then transfer to the mainstore are not seeing the malls and – if this means that creators are withdrawing from outliers to focus on their mainstores and the Marketplace – then malls will take a serious hit, unless they have a strong theme or their owners are prepared to make a commitment to them above and beyond building them and then collecting rents. The stores themselves may be little more than advertising hoardings, but the creators should be encouraged to update them, and the owners should be prepared to add value, perhaps by competitions, hunts, or events or even – dare I suggest – advertising in magazines like Prim Perfect. Now there’s a radical idea! I don’t think Creators can afford not to be on the Marketplace, ( says she who at this given moment has nothing listed there, explain why later ). I’m with the majority , I use it as a catalogue predominantly then wander Inworld after the fact ( if time permits ) . I DO accidentally come across some real gems on the Marketplace that I’d be less likely to discover Inworld ( though this is because my main objective in SL is to work, I rarely get wander time). My SIM is one of those places you need to be prepared to let rez but I like to think I’ve made it beautiful & unique enough to make this an enjoyable experience for the consumer, that and large proportions are pure recreational focus. That said, the way I do things is not for everyone. Then again neither is my content. I consider my lovely consumer base niche market. I will never give up my space Inworld in lieu of the Marketplace, it’s the perfect space to explore the potential of what we can do in this medium. Financial success of my business is only one facet of what I find satisfying & rewarding as a Creator/Artist/Designer. Definitely a focus, though if that was my exclusive focus I’d stop designing beautiful odd decorative pieces and make adult products instead. That or more AV centric content. PS The reason I don’t have content on the Marketplace currently is that I hate the marketing side of work in SL. I hateeeeeeee the time involved getting content on the Marketplace. I’m undisciplined that way AND when I muster the energy to do it I want it pristine in presentation. I’m working on it, my brilliant Christmas content ( she says with no modesty whatsoever ) will make it’s way there. I have no choice, I have Creator friends constantly smacking me on the back of the head for my errant ways in this department 😦 Mentors can be mean. ( Bless them though, seriously). This is a really interesting post and very current. I had a couple of satellite stores for a while and I also found sales were close zero, I decided it was a better idea to put that money into a full size sim. As a consumer I prefer to shop on the market place simply because the search function is far more reliable than in-world. But I do like to TP into a store just to get an idea of the quality before I purchase. And the other perspective, as a designer, I think my sim is necessary as people love to see houses in world and some will not purchase a home without experiencing it in world. The market place brings a lot of traffic and is an ideal platform to advertise and provide detail information about products. I think it’s hard for customers to take a designer seriously if they can’t see their products in world or don’t have an in world store, particularly for prefabs and furniture and especially if they are not familiar with the brand. 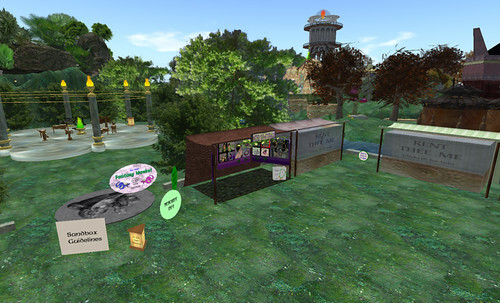 The writing is on the wall for inworld malls, the new beta viewer has a shop link that takes you to the marketplace, the new project LR game in which you can collect Lindens, has a link to the marketplace when you cash in your crystals, all roads are pointing to the marketplace. I’ve had discussions with furniture makers who tell me the bulk of their sales are on the marketplace, which surprises me as I’m in the camp whereby for buildings and furniture I want to see it inworld, inworld certainly adds richness to those sort of items but when it comes to clothing, you can have several pictures on the marketplace, there’s more scope for adding information on a marketplace listing. Merchants really do need to have a marketplace presence. Avination has an interesting approach to a Marketplace-ish website in the works that is kind of novel: you search for products in it, but when you find the product on the website, you don’t buy it there, instead it provides you with a slurl link that plops you down in front of the appropriate vendermatic in world. I also like Avinations ideas on how to do a marketplace. Hoping it will be ready soon. Interesting article. I would never have considered SL Marketplace a serious threat to in-world stores and shops. I thought of it more as mass advertising. If you make more sales in Marketplace, aren’t you almost defeating the purpose of being in-world at all? Create the slurl and redirect to your in-world site. Linden Lab will get it’s percentage, no matter where you sell at! I personally love the MP for shopping as others have said, it’s great for searching. In world search gets really tedious due to lag, inappropriate search terms and search being generally borked. But once I find what I’m looking for on the MP I also like to check out the store if I don’t know the brand. I’m with Eliza, I don’t think I’d give up my IW store in favour of a purely MP based business, unless time no longer permitted me to manage my sim. Marketing and keeping product lines updated can be time consuming and I work a RL full time job, so time is often of the essence. But I enjoy my sim and I know my customers enjoy wondering through the builds in the environment I provide. When I was building my business up I started with MP place only out of necessity, as my business grew, so did my land mass. It’s a terrible shame that inworld stores are closing, to me exploring is core of what SL is all about and I hope people don’t just purchase on the MP and stay on their islands. Unfortunately I think there is a bit of a stigma attached to MP only based business, it gives the impression the merchant is only interested in profit because they have zero operational expenditure or the product line doesn’t support their expenditure, it’s not always the case, but it does seem to be an ongoing trend. Mp can be handy for a quick look if you are in a hurry but indeed it kills the malls. Funny is that the approach off avination wants to do exactly did with mp in secondlife. ..want to see the product first but allso how they present it to know the quality of the creator. You be amazed as it been said in this blog….beside how messy mp became. Last time just looked for a simple word a key and got so many porngraphic pictures…while i just wanted to have a key to open a door. No in that case hope soon avination reveal and in meantime take the afford to hop over to sims and adore the creators……. 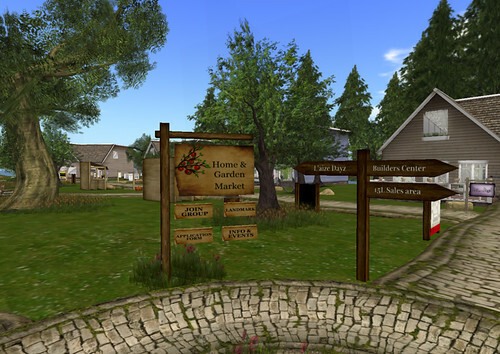 I don’t think the Marketplace is hurting designers – not even their inworld stores. Most anecdotal evidence suggests that people buy from the Marketplace when in a hurry, but often they find something there, and then tp to the store to buy. Either way, the designer is getting the money. Job done. then the marketplaces are going to be squeezed. The creator still sells, whether people buy from the mainstore, the Marketplace or the outliers. But if they are selling very little from the outliers, it makes economic sense to them to close the outliers in the markets/malls, and focus on their mainstores and the Marketplace. Which means that sims are losing the small outlier stores that pay their tier, and we are seeing them fold under the pressure. ElvenMyst, Jabberwock, Greater Ireland, Inner Child Depot, all going or gone. It’s great that Linden Lab are creating tools for roleplay that they are planning to make available to creators. But the issue of how sim owners can support their sims to play these games needs to be urgently addressed (and no, I don’t think a tip jar is going to cut it). Hrm… Marketplace affecting Malls/Roleplay vendor stalls… fewer performance fee-paying music venues, most are tips-only now… is there a pattern here? Common issue at the heart of it? Too much flowing to the Labbies because tier is so high, and doing something for the love of it for so long becomes a chore… then frustrating because it all ends up in the till at Battery Street? 1-Charge a delivery fee. If purchasers must pay a little more for the convenience of instant delivery they may be motivated to shop in-world. 2-Pass Land Marks vs. slurls. When using marketplace as an index on a smart phone, at work, or on a laptop at Starbucks logging in may be out of the question. A LM to use when in world would be a big help. Sorry for replying late but I must comment something. 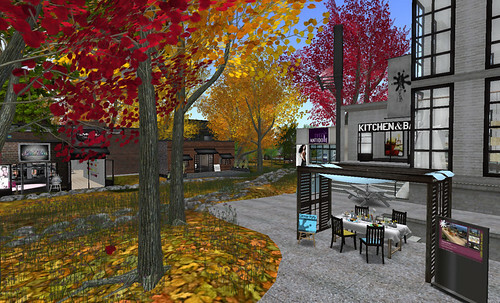 The main problem is that the shopping experience is mostly the same inworld as in the marketplace: Just boring photos! These photos bring – depending on the talent of the photographer and his photoshop skills – sometimes good, but often bad surprises. I want to see the item inworld and I want to TRY clothes. I cannot count how much clothes I immediately deleted after purchase and first try. Why don’t offer all shops demos? If that would be changed, the shops would be way much more frequented. And another thing: I HATE when items are sold in boxes but I cannot rez in the shop. That is as well totally customer unfriendly. I saw this blog mentioned on Berry’s recent blog post, and have just read it. A really good article, and I will be following your blog in future. Thank you for such a well researched article, complete with quotes and examples! Good article, thank you. Well i think Mall owners give (or gave) up too fast. Many of my friends, as well as myself have our favorite malls to go to. Its fun to walk around and look at stuff. Almost like RL. I am running a mall on my alt too and its still doing just fine. Malls like “Inner Child” would still run good because it was very popular too. People like to see stuff inworld, rather than just a picture. And shopping on MP can be a pain sometimes.